Just got my new tent trailer and wonder what I need to consider if I don't want to carry a battery since it weighs quite a bit and don't see me using it much while camping because I plan to always be in a site with shore power? My understanding is that while plugged into shore power the battery is charging if it's installed. If it's not, then the ends of the battery cables will need to be covered so they don't short out. However, will not having a battery installed damage the trailer in any way? What happens if I connect the battery cable ends together to complete the circuit? A guy at an RV shop I go to said that if I don't have a battery on the unit that something could be damaged in the trailer. I don't know if that's actually true. since you don't mention the model popup you have, i can only say that it's the law to have a battery installed, if the trailer has electric brakes. so, not knowing the model, i don't know if yours has electric brakes. also, need to know what brand and model converter yours has. some can work without a battery and some can't. also, somethings may not work without the battery installed. Wow, thanks for the fast response. I have a '98 Rockwood Freedom 1620 without electric brakes. I don't know if the battery is required to operate anything. I do that that shore power operates the interior and porch lights ok. Haven't tried the furnace or fridge yet because I've just recently bought the trailer. I assume the furnace and fridge work off of shore power or propane but not the battery. So, the only thing I can think of that the battery would operate would be the lights. I don't know what type of inverter it has. Oh, and tying the ends of the battery cables together will cause quite a light show when you plug the unit into shore power. Dead short across the converter. You could probably go without a battery, but when the guy next door blows the breaker at 2:00 am, running electric heaters, you will wake p cold. If you had the battery, you would be warm. 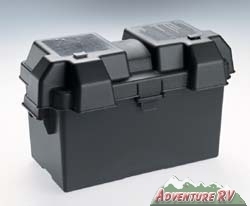 Also, if you are so close on weight that a 40 pound battery makes a difference, are you even safe towing? Are you sure the trailer doesn't have electric brakes? you have a converter, not an inverter. it converts the 110v shore power to 12v, since the lights and other stuff run off of 12v power. that's why a battery is important. if the shore power is lost, everything will run off the battery. most popups with fridges, instead of an icebox, have 3-way fridges that run off of shore power, propane and 12v. but the electronics run off of 12v. so does the furnace's electronics. the only thing i know of, in the simpler popups, that actually runs off of 110v shore power, are the outlets. Looks like I'm going to have to use the battery because that's how the trailer was designed to operate. Good choice. You mentioned "... battery cables will need to be covered so they don't short out". If you mean should the battery be covered, then the answer is yes. The battery should be on a tray in a box. I had a little Coachmen 165 pop-up for 15 years, no electric brakes. Once the original battery died I never did replace it. We used the camper as a glorified tent and kept flashlights inside. Only once did we have electric and lost it during a thunderstorm, our only concern was we had a 12 volt Coleman cooler so I just plugged it into the vehicle until the power came back on a couple hours later. If we camped in the winter we had a little electric heater to keep the camper warm but luckily we never lost power when winter camping.